New Guinea and even the Dominican Republic produced some 2,700 tons of gold in the last year with the top 10 companies producing over 20% of the overall yearly gold production. techniques, this mine has created a crater more than a mile across. Also, in terms of value, Grasberg produces more copper than gold and is also seen as one of the world’s largest copper mines. Lihir Island, New Guinea – Located at the crest of a geothermically active volcano, this mine is responsible for some 64 million ounces of gold with production slated to ramp up after retrofits. 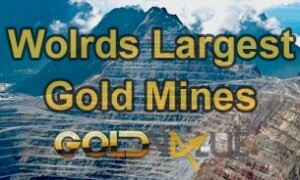 50 million ounces, is actually somewhat speculative and is currently owned by the Uzbek government. Central Siberia, Russia – Located in the heart of the most prolific area in Russia for natural resources, Olympiada represented some 9% of all Russian gold production in 2012.
the potential gold mining production from this mine could easily exceed 46 million ounces of gold. mines are privately held and others are at least partially government owned which makes investing in them a challenging prospect at best.